Paradigm Initiative Nigeria (PIN) hosted a town hall meeting for its pilot ICT and Entrepreneurship training programme called the L.I.F.E. (Life Skills, ICTs, Financial Readiness And Entrepreneurship) programme which held in Ajegunle. In the presence of parents, stakeholders, volunteers, partners, community leaders and alumni of the program, certificates were presented to 10 alumni of #AjegunleLIFE who were deemed to have fulfilled all requirements for the completion of the program. The ‘Right to be Forgotten’ is the concept that individuals have the civil right to request that personal information be removed from the Internet. The Right to be Forgotten is intended to cope with privacy risks online by empowering individuals to control their own identity and information in the online environment. Thus, if an individual no longer wants his or her personal data to be processed or stored by a controller (e.g. twitter) and if there is no legitimate reason for keeping it, the data should be removed from their system. While the Right to be Forgotten aims to support personal privacy, there is a concern is that it conflicts with the open nature of the Web and the free flow of information. The interests of one individual in removing information from the Web may conflict with the interests of another individual or group. For example, there is an ongoing concern about giving the privilege of ‘Right to be Forgotten ’ to Public officials who voluntarily offer themselves for political positions and who live on tax-payers money. In our considered view, Private Citizens are entitled to ‘Right to be Forgotten’ but same may not be said of public officials however, because such mechanism is required to make public officials accountable to the people. That’s why PIN alongside 47 organizations spread across five continent signed on to an Open Letter written in opposition to Twitter’s recent decision to revoke the ability of the tool Politwoops and similar tools. Twitter seem to reason that “No one user is more deserving of that ability [to delete a tweet] than another. Indeed, deleting a tweet is an expression of one’s voice.” We hope we will be able to convince Twitter to rescind its decision on Politwoops. Dr Tomi Oladepo is an independent digital media consultant and researcher. She holds a PhD in Cultural Policy Studies from the University of Warwick. Her doctoral research looks at ways of developing democracy through digital media, specifically developing a culture of democratic thinking, behavior and communication. She has a very strong interest is online media and has experience in radio broadcasting, film and documentary production. Her areas of research interest are: digital Media communications (social media, mobile telephony, blogs and more), the public sphere and the politics of public culture, cultural and creative enterprise, Africa, human and cultural rights, and democratization. Topic: Data Privacy Law. Does Nigeria need one? Nigeria has a major data-related problem as there seem to be no end to biometric data collection in Nigeria. Some few days ago, the National Youth Service Corps (NYSC) commenced clearance based on biometric data capture for corps members. Very soon, biometric data may be required by schools and night clubs. Without doubt, it has widely been recognized that personal Information has value both from a commercial and criminal perspective. However, many countries have developed and implemented Data Protection and Privacy legislations which lay down the rules in relation to what constitutes acceptable and lawful processing of the personal information of their citizens. Sadly, this is not the case in Nigeria. All of these (Biometric data capturing), are happening without a Data Privacy law and this is a big shame on the ‘giant’ of Africa. From mandatory NCC sim card registration to mandatory CBN BVN registration and now the National Youth Service Corp. A major cause of concern is how these institutions are happy to implement the biometric data collection processes with a lot of vigor without a commensurable approach towards ensuring the rights of the owners of these data are protected. One thing a data privacy law will do for Nigeria is that it will specify clearly who can collect data and who it can share same with as well as required procedures. Perkins Abaje is a self-motivated information systems solution and wireless sensor networking systems developer. Perkins has a master’s (MSc) degree from the University of Greenwich, London, in Computer Systems and Software Engineering, as well as a bachelor’s degree (BSc) in Computer studies from the same University. He has been involved in data mining and development of smart systems for environmental monitoring. Perkins has recorded successes working with multiplicity of IT solution tools, to support outstanding services in education and e-government. In response to an investigative report published by Premium Times, PIN wrote a 2 paged letter to Nigeria’s President, Muhammadu Buhari to protest the violation of human rights of private citizens as well as abuse of power by some Governors in Nigeria. The letter was based on PIN’s earlier work on the subject of Internet Freedom. Relevant agencies and offices such as The Senate President, National Human Rights Commission, Amnesty International, Femi Falana Chambers were copied in the said letter According to the Premium Times report which quoted sources from the National Security Adviser’s office and some of the governments under investigation, the illegal practice of intercepted calls and hacked phones and computers gave these public servants backdoor access to many people’s private lives, at the expense of taxpayers they swore to serve. Also, PIN in collaboration with EiE Nigeria and BudgIT hosted the #OfficeOfTheCitizen hackaton on August 29, 2015. The PIN team coordinated proceeding at the event which was held at BudgIT office in Lagos. The #DigitalJobs team spoke about the benefits of online work and available training opportunities at the South-South edition of #TENTWorkshop which held at University of Uyo on the 13th and 14th of August 2015. 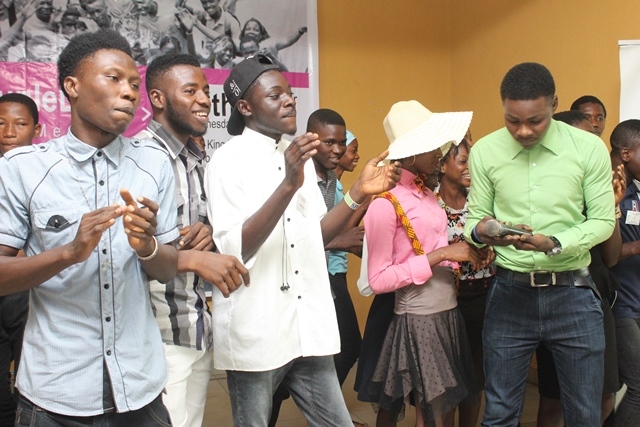 PIN hosted the South-South edition #TENTWorkshop at the University of Uyo from August 13th – 14th 2015. 305 students from the University of Uyo and University of Calabar attended the 2-day event. The speakers at the workshop were Aniedi Udo-Obong, Country General Manager at AfroCabs, Editi Effiong, Chief Executive Officer at Anakle and ‘Gbenga Sesan, Executive Director at Paradigm Initiative Nigeria, who engaged the students for the oral and practical sessions with topics ranging from Software developments and Start-ups. At the workshop, the students learnt about the need to build an entrepreneurial mind set and how to access relevant opportunities from the speakers. L.I.F.E. 2015c training session commenced on the 3rd of August after intensive selection processes at Aba and Ajegunle Innovation Centres respectively. 40 successful applicants were selected for #AjegunleLIFE while 70 were select for #AbaLIFE. 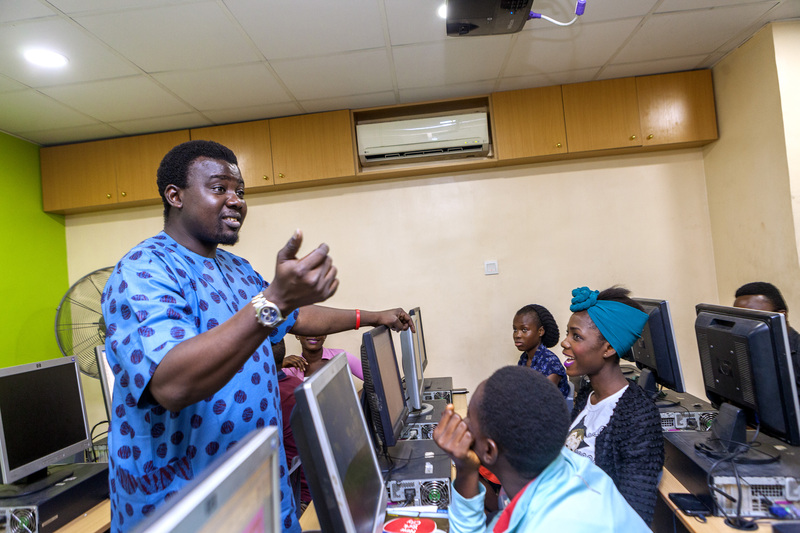 The 2015c students were trained on various Microsoft Productivity tools, Graphic Design and introduction to the use of internet in the month of August. As part of L.I.F.E. Program community engagement effort, the AjegunleLIFE team visited religious organizations in organization. PIN also partnered with RAD5 technologies and Campus Impact Network to host the Aba Teen Code Camp from 3rd – 13th August, 2015. The Code Camp held at PIN’s Aba Innovation Centre. By ParadigmHQ | ICTs, L.I.F.E. Topic: Should Citizens Data be compromised by Banks and other Agencies? The right to privacy is no doubt a constitutionally guaranteed right for all citizens of Nigeria according to Section 37 of the 1999 Constitution of the Federal Republic of Nigeria as amended. There is an ongoing violation of this constitutionally guaranteed right by data collecting agencies in Nigeria. From Banks to Telecoms to Government agencies such as Federal Road Safety Commission, Independent National Electoral Commission, Nigeria Immigration Service, National Identity Management Commission etc. Each of these agencies has collected private data of citizens including biometric data but has breached the trust required of a data custodian/ data collecting agencies either by negligence or as a deliberate action. These personal data of private citizens are now available for sale in the black and open market. The situation is so bad that vendors openly advertise sales of private data of citizens on social media. Nigeria needs to wake up and stop putting the cart before the horse. 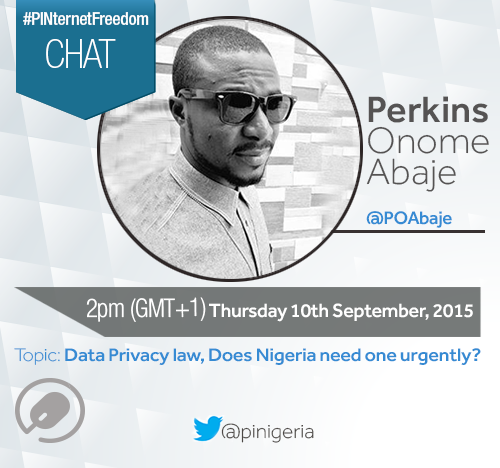 A Data privacy law should have been the pre-requisite to biometric data collection in Nigeria. with a cross section of professionals across various cultures in Africa and Europe in solving problems at a complex level. He brings a strategic and creative approach to his works that comes from his diverse entrepreneurial, consulting and technical experiences in the field. He has been listed among the top 20 most influential Technology people in Africa (2013) by South Africa IT News and among the Global Top 20 Mobile Commerce, Mobile Payments, Mobile Banking and Mobile Money influencers in Social Media by Obopay LLC USA (2012) to name a few.